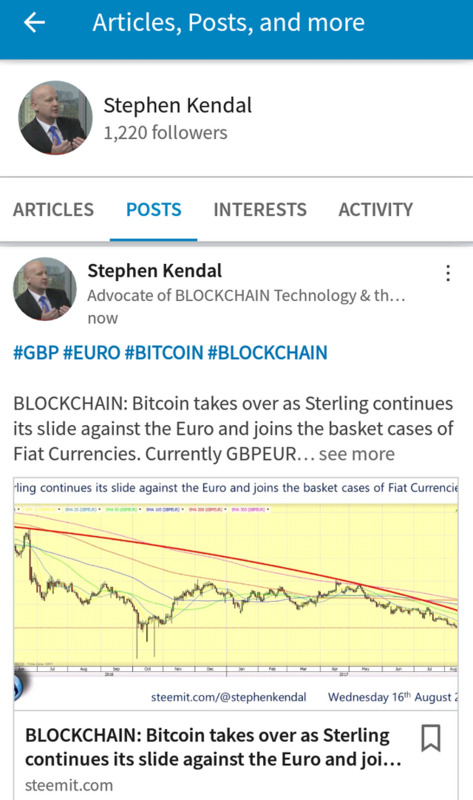 BLOCKCHAIN: Bitcoin takes over as Sterling continues its slide against the Euro and joins the basket cases of Fiat Currencies. Currently GBPEUR = 1.09883 BEARISH..!! The writing is clearly on the wall. All Fiat Currencies are now a basket case. It is simply a matter of which one is the least. People wonder why BITCOIN is rapidly going up in value. Here's your answer. It's not that BITCOIN is going up, it is simply that ALL Fiat Currencies are going down..!! 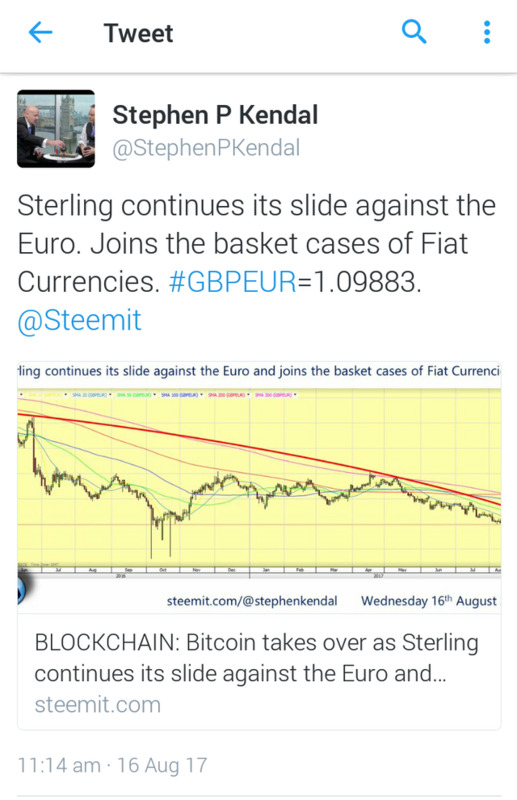 A classic example of this is the GBPEUR currently trading at <1.09883. Despite the continued brainwashing and utter garbage and vomiting diarrhoea of the Mainstream Narrative that the Economy is strong, people are still clinging on to the: lies, manipulation and fraudulent reporting of what is really going on. The Global Economy is not strong, far from it. It has not been this bad for over +100 years. You read it right, I did say +100 years..!! Despite the utter garbage being reported, the Global Economy is in a DEEP, DEEP, DEEP, DEEP RECESSION and has been since the mid 1980's. If you extract the thousands of $trillions of toxic DERIVATIVES, hundreds of $trillions of un-repayable DEBT, and tens of $trillions of STIMULUS measures continually being made, the Global Economy is in a bad, bad, bad way..!! What we are witnessing right in front of our eyes is the controlled demolition of the Global Financial System and only a few seem to care. This controlled demolition is speeding up, despite the warning bells ringing around the World with the meteoric rise of BITCOIN, that has seen it grow from under <$100 in 2013 to the recent highs >$4,300. If this does not paint the real picture, nothing will..!! What we are actually witnessing is the end of Fiat Currencies and things are set to get a lot worse, a lot, lot, lot worse, as the reality finally sinks in that the >$750 trillion of Global Unfunded Future Liabilities have absolutely no way of ever being paid off. It is the Unfunded Future Liabilities that will be the final nail in the coffin for Fiat Currencies as the +45 year Financial Experiment draws to a close. As the demise of Fiat Currencies slowly sinks in, BLOCKCHAIN will take over. Evidence suggests that 2016 will be etched in the history books as the Banner Year for BLOCKCHAIN TECHNOLOGY, the same year that saw the start of the end of the Fiat Currency Experiment..!! come and have a look @thedamus i bet you'l like my shizzle manizzle! Interesting news. Also interesting that Bitcoin beat paypal in terms of market cap. Great post and totally agree with you,but i still can't believe a lot of people have never heard of bitcoin. I'm sick of telling people about bitcoin and how bad the economy is,but sometimes it's like talking to a brick wall,thanks for sharing. All fiat currencies are pretty much getting slaughtered. The US and everyone else is going to make up fake things to manipulate the markets and help the fiat system again but it is not working. It is a failing system and as you said the blockchain is going to take over and we will not have to worry about these fiat currencies which are purely based off debt. Block chain is truly the Future !! So way is silver/gold still down? Accurate analysis of the current, past and future of fiat. We have been in recession since the 80's. Again spot on when you look behind the propaganda curtain.